Ultimate Ears Cardboard Box Packaging Gunmetal Blue In-ear earphones metallic travel case 1/4" adapter jack attenuator cleaning tool kit kit Extender Cable Housed within the universal body are three individual speakers and an integrated passive crossover circuit board that directs the low-end frequencies to a dedicated speaker for bass the mid-range frequencies to a speaker for the vocals and the high frequencies to a speaker dedicated for treble. 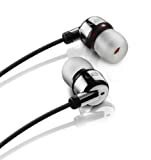 The changeable ear tips provide -26dB of isolation and passive noise cancellation. More than just a pretty package¿MetroFi 220 earphones give you clarity, smooth range and a clean thump in a sleek design. The 220s keep you in touch with the world around you while letting you hear your music clearly. The comfortable, compact design sits securely in your ears while you go about your day. Hear your music as it was meant to be heard, with clarity, smooth range and a clean thump. 75% of the top touring musicians use Ultimate Ears Custom Earphones, now you can experience the same quality of sound in an earphone created with you in mind. For people who take their music everywhere they go, the MetroFi products are designed to fit into a busy life. 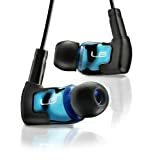 Ultimate Ears by Logitech. How music is meant to be heard.